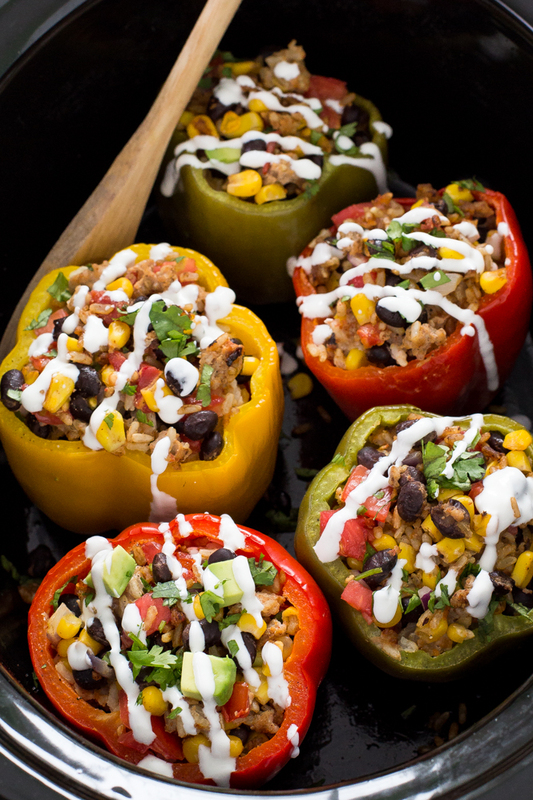 Mexican Slow Cooker Stuffed Peppers. Loaded with enchilada sauce, black beans and corn. A quick, easy and satisfying meal! There is so much you can do in a slow cooker. From desserts, to breakfast, you can basically make anything in a slow cooker. Throw everything together and come home to a warm meal. I wanted to make one of my favorite recipes in the slow cooker. 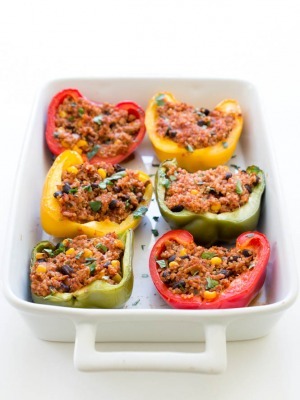 I adapted my recipe for Healthy Mexican Quinoa and Turkey Stuffed Peppers and made it slow cooker friendly. This time I used brown rice in place of quinoa and added enchilada sauce for extra flavor and a little kick. Healthy, satisfying and loaded with flavor. These stuffed peppers are cooked until perfectly tender. A filling, hearty and flavorful meal. 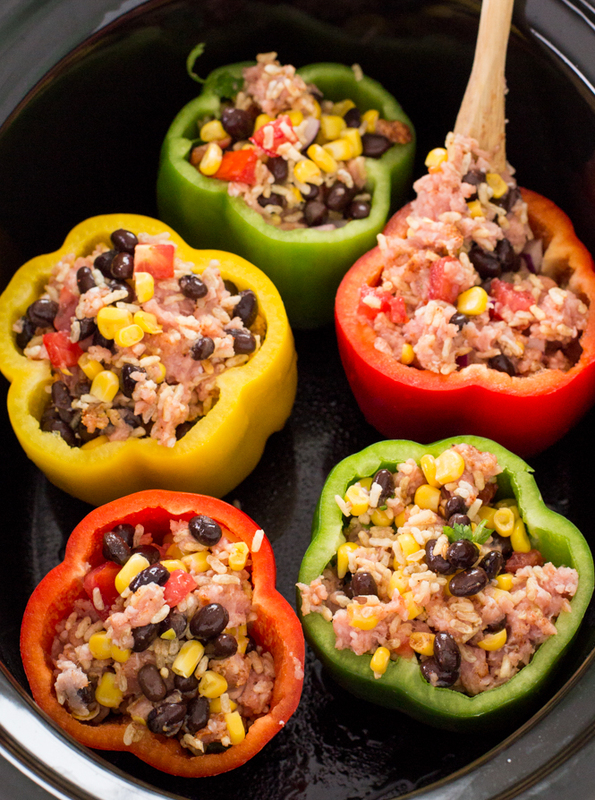 The stuffed peppers are loaded with lean ground meat (use either beef or turkey), black beans, corn, enchilada sauce and cheese. Cumin and chili powder give the filling a little kick. Feel free to substitute quinoa or white rice for the brown rice. You can even make it vegetarian and omit the meat. This is also great if you have leftover rice you need to use up. Throw in some leftover Mexican rice, white or brown rice. You really can’t go wrong with this recipe so toss in what you have on hand. Top with sour cream, fresh cilantro and extra salsa for garnish. I like to serve mine with a sprinkle of cheese, enchilada sauce, sour cream and of course hot sauce on top! If you don’t have time to make it in the slow cooker check out my baked Mexican Quinoa and Turkey Stuffed Peppers. Spray the bottom of a slow cooker with nonstick cooking spray. Place the peppers inside. In a large bowl combine ground beef or turkey, rice, black beans, corn, enchilada sauce, cheese, seasoning and a sprinkle of salt and pepper. 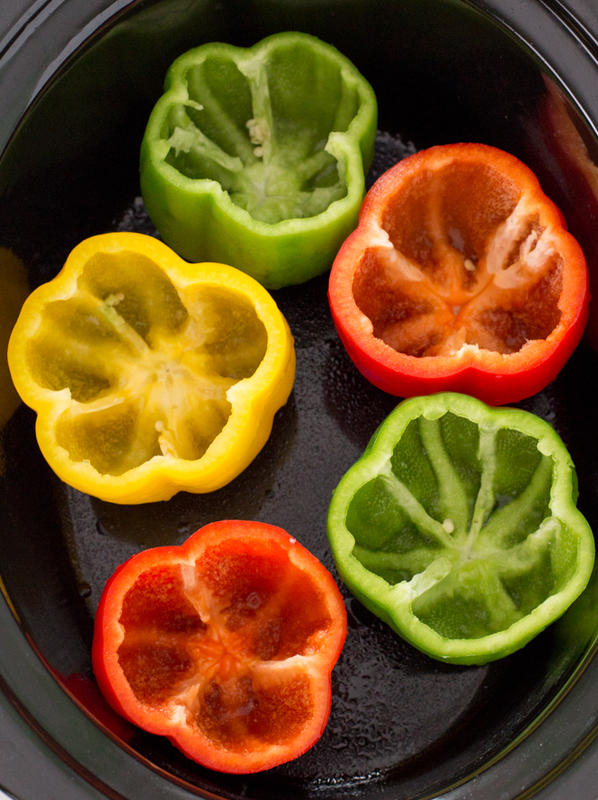 Place the filling into the cavity of each pepper. Cook on high for 2-3 hours or on low for 4-6 hours or until the meat is cooked through. Serve immediately with some of the optional toppings, if desired. Goes great with a side salad! I love love pepper! these look so delicious! What a great idea for the slow cooker Kelley! I am putting these on my list! 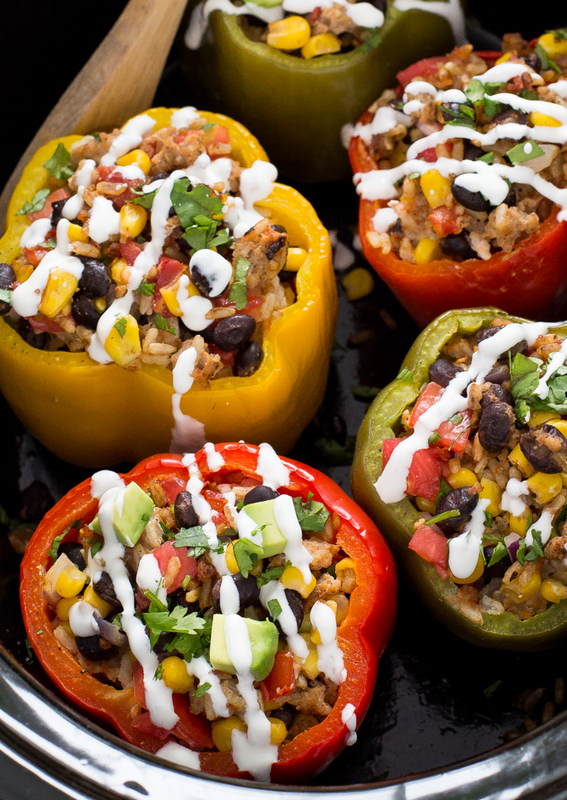 Love that you made these peppers in the slow cooker! Can’t wait to try the recipe! These look and sound delicious! The idea of doing them in the slow cooker is genius! Slow cooker meals are my favorite! 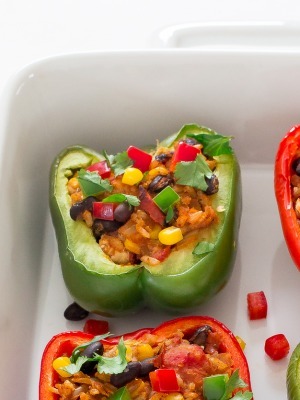 Love that you made stuffed peppers in there! They look amazing! I’ve yet to try making stuffed peppers in the slow cooker. I love these!! The slow cooker size is missing. Some of use have 4-quart cookers. Which size is used here? I used a 6 quart slow cooker. I’m going to try this. It looks good and easy and that is what I’m about. Thank you. How are they leftover? Looks delicious! Leftovers are great! They should be good for 1-2 days in the fridge! I’m wondering if I could stack them to make more; 5-6 wouldn’t be enough to have leftovers for lunch. Also, can the beef mixture be made ahead? The beef or turkey mixture can not be made ahead of time. It cooks in the slow cooker with the peppers. My slow cooker was only able to fit 5 peppers (you may be able to fit more if you have a large slow cooker). I am not sure that more would fit even if you stacked them. Mine came pretty close to the top of the slow cooker. I hope this helps & that you enjoy! Thank you! I was wondering if the beef was greasy from cooking in the slow cooker? No the beef does not get greasy in the slow cooker. I used lean ground beef. This recipe looks amazing! I am wondering – can you freeze this? I am making freezer meals for post-baby. If I make the mix, stuff the peppers, and freeze it all like that, would it hold up okay? Thank you so much! I would cook this first in the slow cooker and then freeze it. I would feel more comfortable doing that versus freezing the uncooked meat in the pepper. I hope this helps and hope you enjoy! Is cooking of rice included in prep time? Yes the cooking time for rice is included. I use minute rice which takes about 5 minutes to make. Have you considered using the work “prepare” instead of”make”. Perhaps that would be more apropos as I’m sure you are not really “making” any of this! I know, I made a typo! So, no liquid added, is it? Have I understood it correctly? Thank you. There is shredded Mexican cheese on top and in the peppers. There is also a drizzle of sour cream on top. Hi, have you ever tried with shredded chicken? I’m just wondering because I can’t do turkey…lol and right now on a no red meat diet. I have not tried this with shredded chicken but I think that should work or ground chicken. So you do NOT cook ground beef ahead of time you mix it uncooked and then stuff pepper ? Is that correct ? No you do not cook the ground beef before hand. Can I omit the rice if I don’t have any? Maybe add a little more black beans and corn? Sure that would be perfectly fine! I’m confused are the beans supposed to be cooked prior or do they cook in the slow cooker? No they are canned black beans and do not need to be cooked ahead of time. They cook in the slow cooker with the rest of the ingredients. Just made this and it was delicious! It was the easiest dinner I have ever made. Will definitely make this again and again. The toppings really give it a flavorful kick! I’m disappointed in this recipe. After 6 hours in the slow cooker, the black beans were not done. Should have said to precook the beans! The receipt did not say to use canned beans! Sorry about the confusion I have updated the recipe to say canned so no one else does the same thing. I had a bit two much and not enough peppers. I was able to fit 5-6 peppers in the crock pot. Here are modifications:– I mixed lean ground beef with the ground turkey. I didnt add the corn because I’m not a fan. However, i did add thinly sliced purple and green onions(scallions). It was enjoyed by all. We took the remaining and put in frying pan -lightly sprayed with non-stick spray and ate it as is. You don’t need to brown the meat before putting it in the peppers? You do not have to but it will add more flavor if you brown before.